X-Press Magazine – Entertainment in Perth – ADVENTURES OF THE IMPROVISED SHERLOCK HOLMES Elementary! ADVENTURES OF THE IMPROVISED SHERLOCK HOLMES Elementary! Following sold out FRINGE WORLD seasons in 2016 and 2017, Adventures of the Improvised Sherlock Holmes returns to Perth in 2019 at The Circus Theatre at Fringe Central from Saturday, February 2 to Saturday, February 9. Starring a rotating cast of the UK’s best comedy improv artists, the story is new each show, with suggestions from the audience driving a bizarre mystery solved by Sherlock. The show rotates around Sherlock Holmes each day, who takes inspiration from the mystery and intrigue of the Victorian era – a time when Australia was a land of allure and enchantment to adventurous Brits. Director Tom Wilkinson says, “The show is completely new every day, prompted by a suggestion slip we pick out of a silk top hat. Everyone in the queue gets to suggest what the ‘case’ Sherlock will solve that day will be”. The versatile troupe of Daniel Nils Roberts and Tom Skelton (Racing Minds), Vicky Hawley and Caitlin Campbell will also be seen in one of the most exciting comedy shows of the season, with the cast being involved in seven shows between them, including Aaaand Now for MORE Kiddo Kaos!, Improv Allstars Up Late and Did You Hear What I Saw? 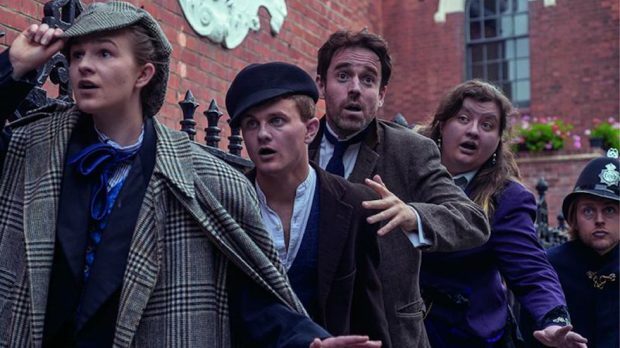 Investigate Adventures of the Improvised Sherlock Holmes at The Circus Theatre at Fringe Central from Saturday, February 2 to Saturday February 9 at 6.30pm. Get more info and tickets here.